Jared Goff is a quarterback for the Los Angeles Rams in the NFL. Since joining the league in 2016, he has shown remarkable improvement moving from ‘rookie bust’ to being touted for MVP honors. In week 4 of the 2018 NFL season, he earned a perfect QB rating of 158.3, completing 26 of 33 passes for 465 yards five touchdowns and no interception in a 38-31 win over the Minnesota Vikings. This was the 49th time such had been achieved in the NFL since 1950. Get to know more about the dynamic quarterback here including his bio, girlfriend, sister, dad, body stats etc. Jared Thomas Goff was born on the 10th of October 1994 in San Rafael, Marin County, California. He had his high school education at Marin Catholic High School Kentfield where he played football for three years from 2010 to 2012. In three seasons, he completed 477 of 762 passes for a combined 7687 yards, 93 touchdowns and 18 interceptions. In doing this, Goff led his school to one North Coast Section crown, three North Coast Section playoff appearances, and three Marin County championships. Goff finished his high school career on a high and was a highly prized recruit going into college football. Jared Goff fended off advances from several colleges who were interested in him and chose the University of California, Berkeley. He spent three seasons at Cal, starting all 37 games possible and shattering several school records in the process. In his rookie season, he was named the starter for the season opener becoming the only true freshman quarterback in the school history to achieve such a feat. As a junior in 2015, he led his school to victory in the armed forces bowl. Overall, in 37 games for the Golden Bears, he completed 977 of 1569 passing attempts for 12,220 yards and 96 touchdown passes. His passing yards, passing touchdowns, passing attempts, and completions are all school records. Asides from his school, Jared Goff also set several records in the Pac-12 conference. His 4719 yards and 44 touchdowns in his senior season are both single-season Pac-12 records and he was named a first team All-Pac-12 that season. Jared Goff forwent his final year of college football in favor of the 2016 NFL draft. He was the first pick of that year’s draft showing how highly rated he is. He was selected by the Los Angeles Rams who signed him to a handsome (by rookie standards) four-year deal worth a fully guaranteed sum of $27.9 million. His first season with the Rams was mostly average, completing 112 of 205 passes for 1089 yards and six touchdowns. His team lost all the 7 games that he started and many declared him a fluke. Goff, however, shut his critics up with a stellar second season. He started all 15 games, completing 296 of 477 pass attempts for 3804 passing yards, 28 touchdowns, and 7 interceptions. The Rams won 11 of 16 matches, clinching the NFC West divisional title and making it to the playoffs. Goff is currently in his third season with the Rams and is showing no signs of slowing down. 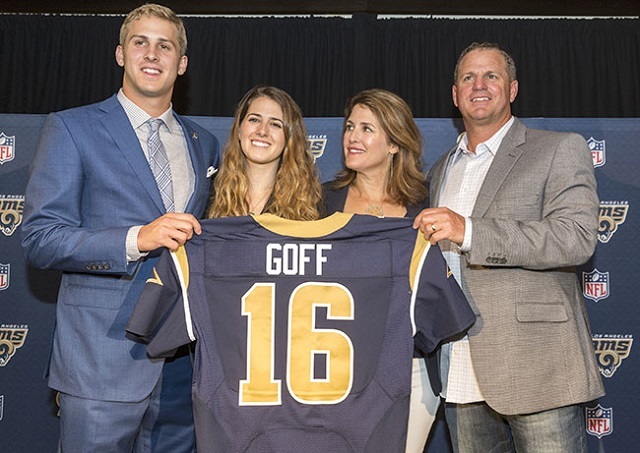 Jared Goff comes from a tight-knit family of four. It includes his dad Jerry Goff and mom Nancy. His parents are both alumni of the University of California Berkeley. Goff’s dad is a former professional baseball player. He played college baseball at Berkeley where his 29 home-runs is the 9th highest in the school’s history. He was drafted into the MLB in 1986 and played for teams such as the Seattle Mariners, Montreal Expos, Pittsburgh Pirates and Houston Astros. He retired in 2000 and now works as a firefighter in his native California. Goff has an elder sister, Lauren and they are very close. She attended UCLA and they are often photographed together. This has led many to jump to the wrong conclusion that she is his girlfriend. Jared Goff’s love life has been the subject of many speculations due to the fact that he is a star player as well as a good looking one. However, he has adamantly maintained that he is single and does not have a girlfriend. In a 2016 interview with Jimmy Kimmel on draft night, he said that he didn’t have a girlfriend. He also repeated it in an August 2018 interview with ESPN. One cannot blame him as he is still a young player trying to build his career. So for now, Goff is single but you can trust that once his status changes we will be the first to let you know. Jared Goff is 6 feet 4 inches tall and weighs 222lbs or 100kg. Additionally, he has an arm length of 32 inches and a hand size of 9 inches. Even though Goff has the ideal size and arm length for an NFL quarterback, he nonetheless experienced some hiccups before his draft. Some had argued that his hands were small for the NFL. With his awesome performances so far, he has certainly proven the naysayers wrong.